The cover story spotlights the 15th Mumbai International Film Festival, focusing on prolific filmmaker Kamal Swaroop’s two selected documentaries: ‘Pushkar Puran’ and ‘Atul’. 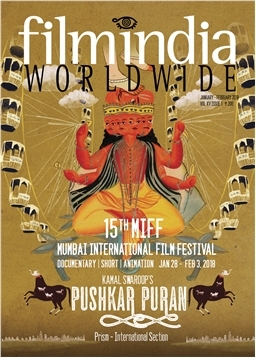 Within this issue's pages are the year’s most anticipated Indian independent films, international film festivals held in India, India-related films at international festivals at Rotterdam, Palm Springs, Sundance, Dhaka and Berlin, as well as India’s participation at the IDFA Forum and Berlinale Talents. There are articles on Bollywood, the burgeoning space for web-series in India, hailing emerging film talent, new books on cinema, a celebration of Mani Kaul's 'Duvidha' as it completes 45 years, and a lot more. © . On Global Screens. All rights reserved.